Villar cites the growing gamefowl industry: Senator Cynthia A. Villar recognizes the huge contribution of gamefowl breeders and suppliers, pigeon raisers, financiers and suppliers as well as suppliers of veterinary products and service providers to the gamefowl industry. 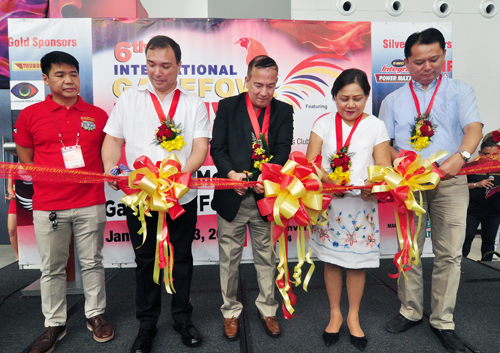 During the ribbon-cutting ceremony of the 6th Gamefowl Festival at the SMX Convention Center at SM MOA, Pasay City, Villar thanks the industry for giving jobs, livelihood and business opportunities to our people. The re-electionist senator also wants our local gamefowl raisers, breeders, hobbyists and traders to create or form business ventures and partnerships with other participants here and abroad. Also with the senator is Game and Amusement Board (GAB) chairman Abraham Mitra.